The very form of this creature is thought to be a form of brand, a punishment for sin. Found in High Wall of Lothric. Found in Cathedral of the Deep. Found in Catacombs of Carthus. Found in Irithyll of the Boreal Valley. Found in The Ringed City. Deep Battle Axe, between the first and second bonfire, inside the tower upon which the Lothric Wyvern perches. Deep Braille Divine Tome, in the lowest floor of the cathedral, in a room before the one that leads to the Deep Accursed. Black Blade, on the path above the Demon, near the entrance to Smouldering Lake. Golden Ritual Spear, on the second floor of the room where you fought Pontiff Sulyvahn. Dark Clutch Ring, in front of the chest with the Old Cell Key. Dragonslayer Lightning Arrow, in a side room in the yard with the Hound-rats. Estus Shard, before the large hall with Peasant Hollows. Titanite Scale, in the main corridor with the patrolling Jailers. Court Sorcerer's Staff, inside the room with only one Monstrosity of Sin. Greatshield of Glory, past the boss room entrance, behind the several Jailer Handmaids. Rusted Gold Coin, past the boss room entrance, behind the several Jailer Handmaids. Sunlight Straight Sword, near the Braille Divine Tome of Lothric, in a room below the leftmost Lothric Wyvern which can only be accessed from above. Titanite Scale, in the room before the lever that raises the main gate. Ring of the Evil Eye +3, in the Shared Grave near the Moaning Knight. 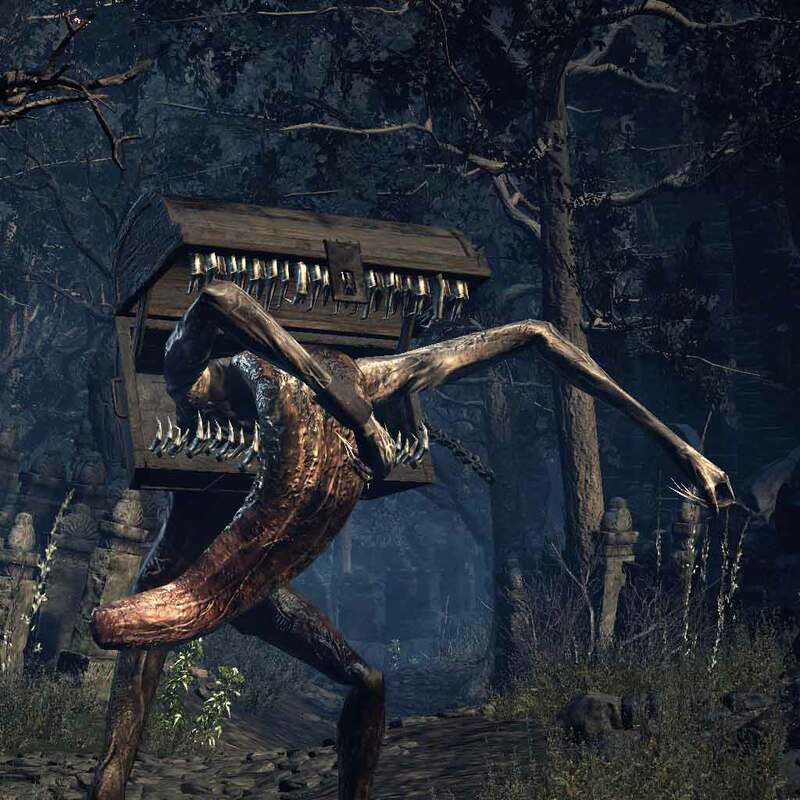 All Mimics have a chance to drop Symbol of Avarice. Most will use the standing moveset, whereas only a few will use the crawling and chest movesets. Your video is redundant. We have a video showing their locations already above your own.